1Department of Surgery, Ahmadu Bello University Teaching Hospital. Zaria, Nigeria. 2Cardiothoracic Unit, Ahmadu Bello University Teaching Hospital. Zaria, Nigeria. 3Dept of Radiology and Radiotherapy Ahmadu Bello University Teaching Hospital. Zaria, Nigeria. Odigie VI, Yusufu LMD, Abur P, Edaigbini SA, Dawotola DA, Mai A,Ameh SO. Broncho-Oesophageal Fistula (BOF) Secondary to Missing Partial Denture in an Alcoholic in a Low Resource Country. OMJ 2011 Jan; 26(1):51-52. The clinical course of a missing partial denture with secondary BOF in an alcoholic is presented. In the index case we report an exceptional clinical course of a patient who did not ascribe his symptoms to his ‘‘missing’’ dentures for several years, the odontologist who replaced an unrecovered denture, and the generalist who administered the barium swallow in an unsuspected BOF. Preoperative optimization of the patient was by blenderized local feeds through a feeding tube gastrostomy and by chest physiotherapy. Extraction of the denture and closure of fistula were done through a right thoracotomy. The importance of a high index of clinical suspicion of BOF in a low resource setting to avoid the morbidity and mortality associated with missing dentures is discussed. Odontologists, caregivers and clinicians must educate patients on the hazards of missing dentures and cases of missing / lost dentures should be adequately investigated / explored in the patient’s history and clinical assessment before they are replaced. Keywords: Bronchoesophageal fistula, Alcoholic, Denture. Most dentures are radiolucenti and when accidentally swallowed, they may cause severe complications in the respiratory and or gastrointestinal tracts.1,2 Diagnosing ingested partial dentures may be difficult in a low resource setting where ignorance may be rife and diagnostic armamentarium scarce amongst patients and healthcare providers respectively. A 42-year-old mentally competent primary school teacher whose hobby was drinking of locally ‘traditionally’ brewed alcohol called ‘Burukutu’ was referred to Ahmadu Bello Hospital with a 4-year history of retrosternal pain and odynophagia, progressive dysphagia for 2 years and cough for 3 months duration. He had woken from sleep after a drinking spree 4 years earlier with retrosternal pain and odynophagia, and noticed that his upper incisor denture was missing. The retrosternal pain was persistent and occasionally piercing in the region of the right xiphisternum. It was worse during meals and swallowing. The odynophagia worsened particularly for solid meals. Three months before presentation, he developed cough, productive of muco-purulent sputum. There was no history of foreign body ingestion. He associated these symptoms to "hang-over" from the ‘Burukutu’ that he habitually drank. He often used paracetamol and antacids suspensions to relieve the retrosternal pain. He-attributed the "lost" denture to mischief by his friends who may have jokingly hidden it while he was asleep. He quickly replaced his denture with a new one, to hide his defect and improve his masculine facie presentation, as a soon to- be – bridegroom. There was no history suggestive of mental illness. Physical examination showed a chronically ill-looking, wasted and malnourished man (weight 46 kg, body mass index [BMI] 14.52). He was dehydrated, pale but acyanotic and had no digital clubbing. The respiratory rate was 38 cycles/min. The trachea was central and there was diminished excursion of the right hemi thorax. Percussion note was dull on the right middle and lower zones and there was diminished air entry and crepitations in the same zones. The pulse rate was 88/min and blood pressure was 90/50mmHg. Examination of the mouth revealed that he wore a partial denture on the upper two incisor teeth. Other examinations were normal. The hemogram was 9.2gm/dl. Serum potassium was 3.0mmol/l and other serum electrolytes were normal. Serum proteins were albumin 15gm/l and total protein 31gm/l. A plain X-ray of the chest showed right lobar pneumonia and no radio-opaque shadow suggestive of denture was seen (Fig. 1a). 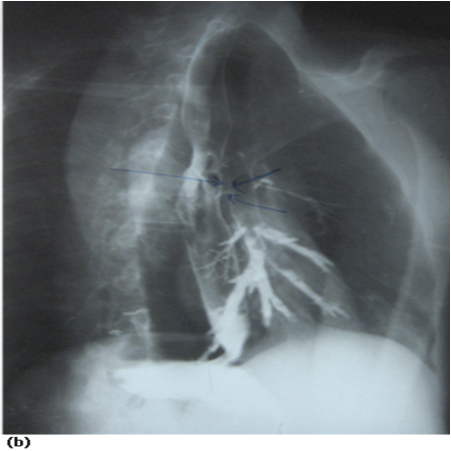 Barium swallow (done at referral hospital) showed contrast leakage into the right bronchopulmonary tree (Fig. 1b). Sputum microscopy and culture yielded mixed growth of Escherichia Coli, Pneumococcus and Klebsiella species. He was resuscitated with intravenous fluids, anemia was corrected with blood transfusion and he was commenced on broad spectrum intravenous antibiotics (ciprofloxacin/gentamycin/metronidazole) based on sputum microscopy culture and sensitivity result. Rigid oesophagoscopy was done. The esophagoscope was arrested at 30cm from the upper incisor and no denture was seen. The esophageal mucosa was hyperemic but normal at the site. A rigid bronchonscopy revealed a 0.5cm benign fistula on the posterior wall of the right bronchus with associated indurations. No denture was visualized. The bronchus was toileted of exuding pus by suction. A feeding Witzel tube jejunostomy was done to aid feeding and he was commenced on blenderized /liquid diet. Chest physiotherapy was also commenced. After 4 weeks of tube feeding, the patient improved (weight 51.7kg, BMI =17.39), he was considered fit for exploratory thoracotomy. Through a right posterolateral thoracotomy via the 6th intercostal space, an incisor denture was found embedded in a dense indurated mass extraluminally in the posterior mediastinum between the right main bronchus and right lateral wall of the thoracic esophagus. One of the flanges of the denture formed part of the wall of a communicating fistulous tract between the lateral wall of the oesophagus and the adjoining right main bronchus. The denture was extracted (Fig. 2), the fistula was excised and the defect in the walls of the right main bronchus and the oesophagus was separated and repaired by interrupted sutures using 3/0 prolene and 3/0 vicryl respectively. Underwater-seal chest tube drainage was left in place. Postoperative recovery was uneventful. The feeding tube jejunostomy was removed on the 14th postoperative day. Histology of the excised fistula and tract was benign and showed evidence of inflammatory cells. The patient was discharged home on the 25th postoperative day with a radiologically sealed BOF and jejunostomy site. He has remained symptom free at 3 years of follow up, weight (84.6 kg, BMI= 26.7). Figure 1: (a) Barium oesophagogram with leakage of contrast into Right main bronchus. (b) Note extrinsic compression of oesophagus. Figure 2: The extracted denture. Unsuspected swallowing of partial dentures with resultant morbidity is often reported in the literature.1-3 A PUBMED search, between 1999 -2009, showed paucity of report of accidentally swallowed denture in an alcoholic African. Ingestion usually occurs after trauma, intoxication, loss of consciousness or sleeps, so there may not be a definite history of ingestion.4 Alcoholics may inadvertently swallow their artificial denture if they lapse into deep slumber after a drinking spree. Patients with ingested dentures, usually present with dysphagia (92%) and tenderness of the neck (60%).5 Other symptoms include; inability to swallow oral secretions, throat pain, odynophagia, hypersalivation, retrosternal fullness and regurgitation of undigested food. In late stages, clinical features may include Ono’s sign,6 and severe wasting. In the index patient, the associated wasting and anaemia were as a result of inadequate feeding. These were corrected by local blenderized diet via a preoperative feeding jejunostomy tube. The patient’s preoperative weight increased (from 46kg to 51.7kg). ; The authors advocate this method in low resource countries where total parenteral feeding may not be easily available /affordable. The diagnosis of swallowed denture can be made by a suggestive history of denture ingestion which was not present in our patient. This should be explored in patient’s history. Most dentures are radiolucent.4,7 They may pose diagnostic difficulties in low resource countries where ignorance about complications in the use of denture may be rife among patients and modern diagnostic facilities scarce or unavailable,; unless a high index of suspicion of a swallowed denture in the setting of a missing denture is entertained by clinicians. Also, because of their rigidity, large size, irregular and unyielding edges, swallowed dentures are apt to impact,8,9 perforate,10 or fistulate,2,11 with resultant morbidity. Acquired BOF is rare12,13 in association with swallowed dentures. It is the author’s opinion that the index denture probably impacted at the thoracic oesophagus close to the origin of the right main bronchus. The right serrated flange edge (clasps and collets) perforated the right wall of the oesophagus and right main bronchus with subsequent migration of the denture between both hollow viscera and the formation of BOF. Peristalsis, food pulsion and ventilatory movements of the mediastinum may have acted in concert to aid this phenomenon. The protracted use of paracetamol and antacids suspensions by the patient was aimed at relieving the ensued pains while the process lasted. Acquired BOF is frequently misdiagnosed. It is characterized by bouts of coughing while eating or drinking, as well as with recurrent pulmonary infections. 6 Delay in diagnosis may be complicated by pneumonia, life-threatening hemoptysis, and respiratory failure.14 Conventional barium esophagography is considered to be a sensitive test for diagnosing BOF. This investigation provides a definitive diagnosis in 78% of cases.12 Acrylic (radiolucent) dentures are more likely to be discernible by computerized tomogram scan- CT scan- or magnetic resonance imaging – MRI. CT or MRI, is more sensitive to small changes in X-ray attenuation than plain radiography.7,15 Access to CT/MRI equipment and the cost are prohibitive in a low resource setting. When the diagnosis has been made, the immediate goal should be nutritional support and minimization of tracheobronchial soilage. Good preoperative chest physiotherapy, antibiotics therapy, bronchial toileting at bronchoscopy and gastrostomy tube feeding sufficed in the index case. Practicing clinicians should be wary in the use of barium swallow in patients with cough, odynophagia/dysphagia.-Adequate history should be exhaustively used by clinicians to search for any missing dentures before replacement while alcoholics should be advised against wearing dentures while drinking alcohol. I wish to thank Prof . E. A. Ameh of the Dept of Surgery ABUTH for his useful input in the manuscript. Haidary A, Leider JS, Silbergleit R. Unsuspected swallowing of a partial denture. AJNR Am J Neuroradiol 2007 Oct;28(9):1734-1735. Rajesh PB, Goiti JJ. Late onset tracheo-oesophageal fistula following a swallowed dental plate. Eur J Cardiothorac Surg 1993;7(12):661-662. Firth AL, Moor J, Goodyear PW, Strachan DR. Dentures may be radiolucent. Emerg Med J 2003 Nov;20(6):562-563. Khan MA, Hameed A, Choudhry AJ. Management of foreign bodies in the esophagus. J Coll Physicians Surg Pak 2004 Apr;14(4):218-220. Diddee R, Ian H. Shaw, Acquired trachea – oesophageal fistula. Cont Educ Anaesth Crit Care Pain. 2006 Jun;6:105-108 . Newton JP, Abel RW, Lloyd CH, Yemm R. The use of computed tomography in the detection of radiolucent denture base material in the chest. J Oral Rehabil 1987 Mar;14(2):193-202. Abdullah BJ, Teong LK, Mahadevan J, Jalaludin A. Dental prosthesis ingested and impacted in the esophagus and orolaryngopharynx. J Otolaryngol 1998 Aug;27(4):190-194. Okoye IJ, Imo AO, Okwulehie V. Radiologic management of impacted coin in the oesophagus–a case report. Niger J Clin Pract 2005 Jun;8(1):56-59. Treska TP, Smith CC. Swallowed partial denture. Oral Surg Oral Med Oral Pathol 1991 Dec;72(6):756-757. Samarasam I, Chandran S, Shukla V, Mathew G. A missing denture’s misadventure! Dis Esophagus 2006;19(1):53-55. Chaky DM, Escamilla C, Sheridan PH, Deboer D. Adult Bronchoesophageal Fistula Diagnosed on Computed Tomography. Radiology Case Reports italics [Online] 2008; 3:126. Aggarwal D, Mohapatra PR, Malhotra B. Acquired bronchoesophageal fistula. Lung India 2009 Jan;26(1):24-25. Lim KH, Lim YC, Liam CK, Wong CM. A 52-year-old woman with recurrent hemoptysis. Chest 2001 Mar;119(3):955-957. McLaughlin MG, Swayne LC, Caruana V. Computed tomographic detection of a swallowed denture. Comput Med Imaging Graph 1989 Mar-Apr;13(2):161-163.